The Salt Lake City area will be getting its own action of live crushing demonstrations this month. MB America, Inc. Atlas Machinery, and DogFace Equipment are partnering together to bring an open house event to show the crusher attachments in action. On April 20, the companies will be demonstrating the BF120, an excavator-mounted crusher attachment, and the MB-L160, a skid-loader-mounted crusher attachment. Both units will be crushing concrete debris. “We’re excited to be working with Atlas Machinery and DogFace Equipment for this demo and growing our relationship with them,” said Kyle Taylor, area manager at MB America. The BF120 is designed for excavators weighing more than 68,300 pounds. It has a productivity range from 20 cy/h to 65 cy/h, depending on the output adjustment. The output can be from a 3/4-in to a 5-in. The MB-L160 is designed for skid loaders weighing more than 9,900 pounds and for loaders and backhoes weighing between 15,400 and 22,000 pounds. It has an output adjustment from 1/2-in to 2.5-in with a productivity range from 12 cy/h to 26 cy/h, respectively. 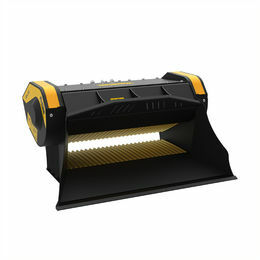 Along with the crushing action, the companies are displaying MB’s magnetic separator and dust suppression kit, additional accessories that accompany the crusher attachment. 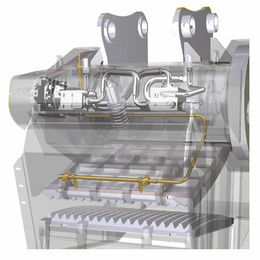 The magnetic separator allows for the removal of steel and the dust suppression kit allows contractors to remain within environmental regulations due to dust produced from the crushing. Other MB products are screening attachments for excavators, loaders, backhoes and skid loaders with appropriate hydraulic flow, along with a selection of grapples and drum cutters for various types of construction work, which includes demolition, excavation, road work, quarries, mines, pipeline work and environmental reclamation projects. The demonstration is on April 20. A BBQ lunch will be served during the event. To RSVP for the live demonstration, please contact the MB at 855-MB-CRUSH (855- 622-7874). Atlas is Utah’s number one dealer of construction equipment and accessories. We offer great brands at affordable prices. We are located right next to I-15 in North Salt Lake, Utah. We are in it for the long haul—for our customers and for our world. Our customers can be found in virtually every corner of the earth, and we realize our success comes directly from helping our customers be successful. We have a long history of customer satisfaction and using leading edge technology to provide customer solutions. Whether we’re researching ways to move more dirt, or stocking products that generate fewer emissions. Our strength is integrating customer feedback with ideas and actions to ensure our customers’ success. Now and in the future. Tom Ramsey, owner and CEO of Dog Face Equipment, comes to work every day wanting to sell used heavy machinery to construction companies, contractors and anyone who’s in need of a bulldozer, excavator or trailer. His team of heavy equipment experts will work with you to ensure that you receive the best price and service possible. Tom thinks that work should be an adventure, not a chore which is how he runs things at DogFace Equipment. There is never a dull day on the lot. Visit our machinery lot in Salt Lake City to find out for yourself how knowledgeable Tom and his team are. If you’re looking for an affordably priced piece of heavy machinery, look no further than Tom Ramsey and DogFace Equipment. Tom Ramsey built DogFace Equipment from the ground up over 10 years ago and hasn’t looked back. Tom really is the top dog when it comes to heavy equipment sales in the USA.